How to Garden and Golf Without the Ache! As we grow older, it’s important that we stay active and enjoy the things that we’re passionate about. And while age may bring us joys like grandchildren and travel, it can also bring us tense muscles, stiff joints and chronic pain. So, how can you keep doing what you love well into your golden years without being sidelined by pain? Whether you’re an avid gardener or enjoy playing 18 holes at one of our local courses, we hope you find these tips helpful. 1. Stretch before you start. Both gardening and golf may cause you to work up a sweat, which means your body and muscles are going to get a workout. Prepare them with light stretching of the legs, shoulders, arms, wrists and back. 2. Stay hydrated. Whether your “green” requires a putter or a garden hoe, you’ll want to keep a bottle of water nearby. Why? As your body warms up and your muscles start working, you need to maintain proper hydration to avoid cramping, headaches and over heating. 3. Listen to your body. There’s nothing wrong with taking a break when you need too—in fact, we recommend it! Know one knows your limits quite like yourself, so tune in and make sure you’re listening. 4. Visit our practice for care. Gentle and effective chiropractic care with us offers your body a chance to remove nervous system interference and balance what’s not quite right. 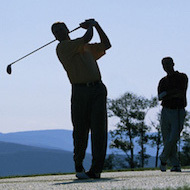 If you’ve sustained an injury gardening or golfing, we can help your body heal naturally. More of a visual learner? Check out these handy infographics! If it’s been a while since your last visit, give us a call! We look forward to seeing you in our office soon.